If you've ever taken a long backpacking trip, you've probably dreamt about food--especially the meal you are going to eat once you get back to civilization. 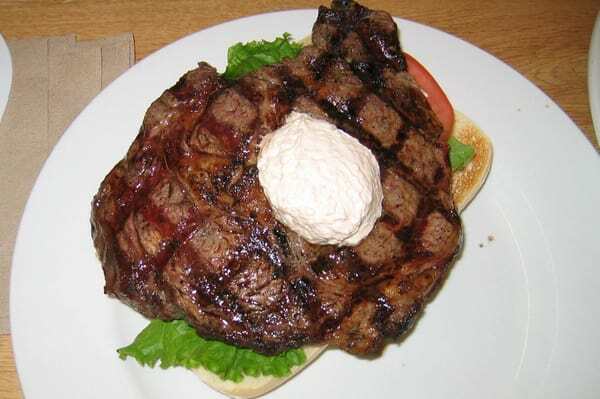 Pizza, hamburgers, steak, cold beer, salad....they all seem to find a place on the menu, once you get started on the idea. Shoot, we know people who have spent most of the last night of a trip talking around the campfire about what they are going to eat the following day at the nearest restaurant. And speaking of restaurants, there are a few that have quite a reputation among backpackers as well. The gas station at Lee Vining, the Old Priest Grade Inn, Pizza in Yosemite Valley all have their advocates. We've come to really like Patty's Gourmet Cafe between Sonora and Columbia. But there is one restaurant that stands out in a completely different way. We have eaten there at least five times in the last ten years, and every single time it has been worse than disappointing. Sometimes the service has been absolutely rude and incompetent--waiting forever for a table in an empty dining room. The last time we had perfectly nice service, and absolutely dreadful food--cold food without even a hint of sauce or seasoning. And the amazing thing is that this restaurant is pretty much the only show in town in a National Park. You'd think they'd want to do better. It's the restaurant at Grant Grove Village in SEKI. We can only wonder what amazing arrangements have been made to make sure that it has been so bad for so long. Anyone else have a least favorite place to eat? Let us know, so we can avoid it! I understand that Kings Canyon Lodge (actually on Forest Service land) comes with warnings to stay away from people who have been there. It's almost as if the owner doesn't really want any business. As for the area around Grant Grove, they are looking to rebuild the restaurant and get a new concessionaire. They've also issued press releases that acknowledge the deficiencies of the current restaurant. I have eaten there once, and yes it was a sad experience. Interesting datapoints in regards to the Grant Grove Village restaurant. I've eaten there a good number of times, especially when I've stayed at the nearby John Muir Lodge. I have found their food to be decent, and if you order easy to prepare things, like their steaks or breakfast items, to be quite good. Edited 1 time(s). Last edit at 10/10/2012 06:47PM by plawrence. In regards to place that I avoid, probably number one up in the Sierra is the Curry Village Pavilion buffet. It simply reminds me of BAD high school cafeteria food. Didn't help that I once attended a weeklong photography workshop in Yosemite where all of breakfasts and dinners were at the Curry Village buffet. I could not agree with you more about the Curry Village Pavilion Buffet. About 20 years ago, it was not too bad but now it is last on the list on places to eat in the Valley. The cafeteria at Yosemite Lodge has been going down hill the past few years. First it started with dinner and now there is sometimes an issue with breakfast. The last time we ate there, both our eggs and pancakes were undercooked. Ever since George left, the people making the pancakes don't know what they are doing. I really miss the Four Season Restaurant that was at the Lodge. It was a good compromise between the Mountain Room and the Cafeteria. Love the Patty melt at Nicelys in Lee Vining after a long day of fishing or hiking. Better yet take it to go and take the turn off to the famous Mobil just out of Lee Vining and drive PAST the Mobil and go up the hill to where you'll come to a lookout parking area overlooking Mono Lake. Great views at sunset and great place to eat your food from Nicely's. The place (Nicely's) is a throwback to '50's diners and interesting to eat in. If you are coming down from a hike out of Mono Village (west of Bridgeport) eat at the cafe there. Yummy and a nice view of upper Twin Lake! Great Patty melt also! Edited 2 time(s). Last edit at 10/10/2012 04:39PM by mtn man. +1 for Nicely's. I always try to eat breakfast there after a back country trip. Never been disappointed. Edited 1 time(s). Last edit at 10/10/2012 06:52PM by The Other Tom. When I have a big appetite (or I'm in a hurry) I'll head over to the Whoa Nellie Deli for breakfast, when I have a regular or small appetite at breakfast I'll head over to Nicely's. For comfort food (breakfast and lunch - they close at 2-ish) I've liked Hays Street Cafe in Bridgeport. like a mound of spaghetti and Half Dome became a bucket of ice cream. boasted. I can only surmise that all other entrants tied for first. I've eaten at BBQ Bill's in Bishop once. That was one too many times. What's your favorite restaurant in Bishop? I always stop at Schaats Bakery for Lunch - they have a turkey sandwich that is made from a freshly roasted turkey (looks like they do this from the whole bird) - #2 on the lunch menu and highly recommended. Holy Smokes is new and I've only had their food once. Loved it. Thanks for the suggestion. The next time I'm in Bishop, I'll check it out. It was El Loco Fijole, but it closed down and is now a BBQ joint. It was fantastic. Family owns an eatery up in Mammoth, as well. Yamatani is OK. Surprisingly good sushi. Whiskey Creek is uniformly good, but pricey. Manor Market has the best beer selection west of the Sierra, period. Whiskey Hill is very good, serves decent food in a nice setting and is excellent (because of their large menu) for large groups with divergent tastes. Yes, it's a bit pricey for what one gets but it has nicest decor and ambience of any restaurant I've been in Bishop. I can't agree with the Amigo's recommendation though. Lot of locals recommend it, but the one time I tried it I experienced some of the most blandest and tasteless Mexican food I've ever had in California. The taste of its Mexican food reminded me of "Mexican" food served out in the Midwest. I haven't been to all the Mexican restaurants in Bishop, but Las Palmas on Line St. has served respectable – authentic tasting – Mexican food the couple of times I've eaten there. I've always enjoyed my meals at the Imperial Gourmet Chinese restaurant. Probably the next nicest restaurant, after Whiskey Creek, in Bishop. Not the best Chinese food I've ever had, but still very well prepared. Edited 1 time(s). Last edit at 10/11/2012 03:37PM by plawrence. Ha! We had just the opposite experience at Las Palmas, but I understand Astorgas is the best in town. Just haven't been there yet. Had a nice lunch at Imperial Gourmet once, but haven't been back. For a bang-for-the-buck experience, go to the Paiute (ahem) Palace casino, sign up for free for their players club, and you get really cheap, decent meals at their restaurant. I hate it, personally, since I hate casinos, the noise there, the smoke, gambling in general, but to those who don't mind those, it's bargain. Have you been to the Thai restaurant by the airport (Thai Thai). Have heard some very positive things about it, but have yet to try it myself. How about the best coffee in Bishop? My vote: Spellbinder Books on Main. Haven't been, but I've driven by it! No, seriously, great reviews universally, but we always seem to overlook it. And coffee? I married a Starbucks worshipper, so there are, effectively, no other coffee shops in Bishop for us. Sigh. Then here's the perfect Christmas gift for her! I had it demoed for me at a local store and it does produce excellent coffee, espresso and lattes. The machine costs $199 and the coffee pods cost about $1 each (cheaper than what Starbucks charges for a latte at their stores). Edited 1 time(s). Last edit at 10/15/2012 11:56PM by plawrence. Then here's the perfect Christmas gift for him! I'm a he who married a she. Okay. Thanks for the clarification. I corrected my post. 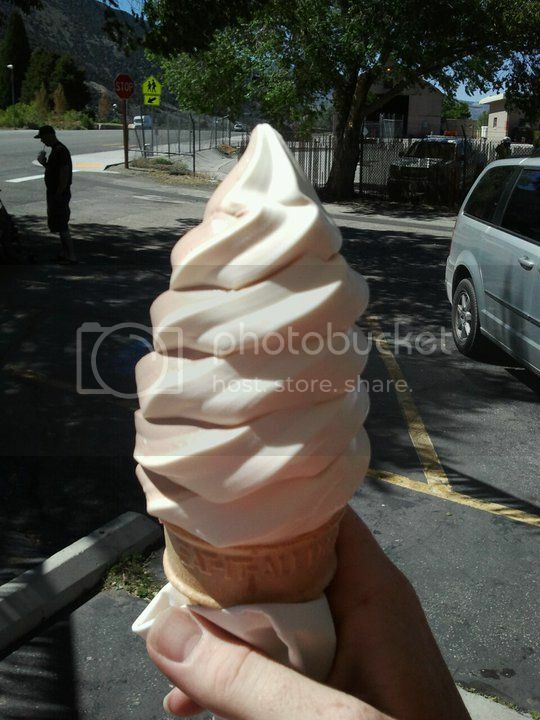 The Mono Cone in Lee Vining serves a pretty good soft serve. Haven't tried their food. I like the Mono Cone for their burgers & shakes. 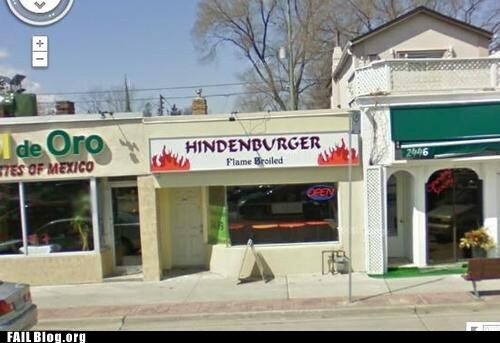 I think it is good for a burger stand type place. 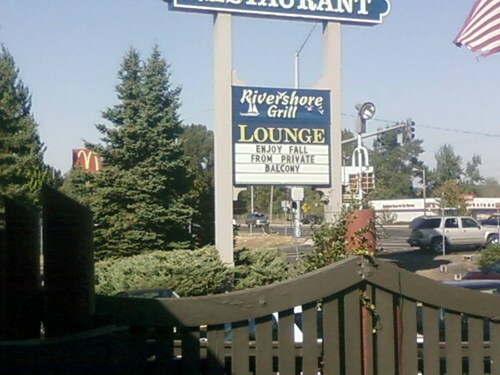 I would avoid the Rhino Bar in Bridgeport. Once ordered a BLT there and after a long wait it came missing one of the letters and wasn't very good either after I got it fixed. I was there about a year ago, went with some friends that live in Bishop and they really like it. I thought it was good, though I'm not a connoisseur of thai food. And now it appears they have gone out of business. Has anyone eaten at the Curry Village Buffet now that it is no longer a........buffet? I have wanted to at least walk through and see what it was like when we were there after Christmas but it was closed. I ate there several times throughout the years. It was ... okay. Not great but not awful either, IMHO. What I cannot quite understand is the high praise for Amigos Mexican Restaurant in Bishop. It's food is as mediocre as BBQ Bill's was (if not worse). It's the most bland Mexican food I've ever eating at a Mexican restaurant in California. It would probably be right at home in Omaha, NE though. Tom's Place seems to be my breakfast favorite. Only drawback, the rudest waitresses of any I know. Edited 1 time(s). Last edit at 10/10/2012 08:40PM by ERICG. Why it gets good reviews is beyond me. I could NOT agree more! Over priced for what you get and the food is not that great. 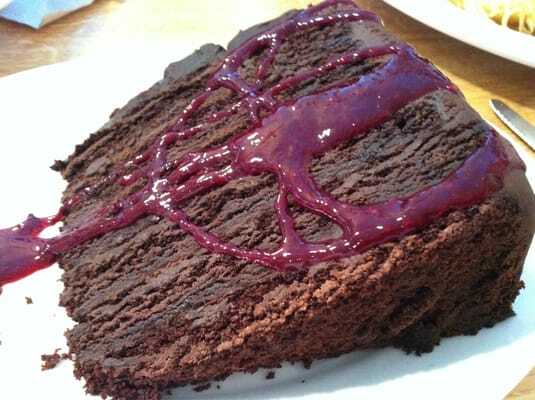 But how can one pass up on a slice of their decadent chocolate cake! In Lone Pine, avoid the Mt. Whitney Cafe/Restaurant like the plague. I could go into detail, but just trust me on this. I agree with Chick-on and hotrod. The last thing I ordered there after a long hike was the Ceasar salad w/ steak strips. The meal was of good quality but the portion was enought for two! I tried to eat it all but just could'nt do it. It was a waste of good food. Mostly, the prices are just too high. I stay a lot in Lee Vining while hiking Yosemite and usually have breakfast at Nicely's and supper at Mikes' BBQ. I'm not into BBQ but really enjoy the salad & soup bar option. Is there still a Schatt's in Mammoth? I thought it closed. It was open last month when I was in the area. However this is not owned by the Schatts in Bishop. Apparently the Mammoth one is run by the original Schatts' brother who branched out on his own. Gotcha, I had no idea, I haven't been to the Mammoth one in 10 years. I disagree. I've only been there 3 times, but every time I found it to be good. Sure, it was a little expensive, but they get to charge what they want due to location. Twice for breakfast and once for lunch. It hit the spot for me. The place I will never eat again is the Kennedy Meadows Diner. Getting sick 12 miles in was not what I wanted to happen. Same lovely experience hit 2 of the others in my group later that night, and the only common place we ate was the Diner. So I'll never eat there again. Anybody been to that fairly new restaurant (small) on the right side of the road (going north) past the courthouse in Independence. Can't remember the name of it. Enjoyed the upstairs bar dining in Grumpy's (Mammoth) off season when they had their 1/2 off entrees on Wednesdays. But now that they've discontinued the 1/2 off Wednesdays I may have to rethink going there. I have never had breakfast at Whoa Neli. Maybe I need to try it. Since the intials on the box in the background are PFK one has to guess that this is the Canada KFC? Plese tell me that isn't a breaded uncooked piece of chicken? It looks like a Slug on a bun! Hmmm..... I've not tried them that way. Usually fried in a little olive oil, some garlic. Next time I go to the coast I'll have to try that. 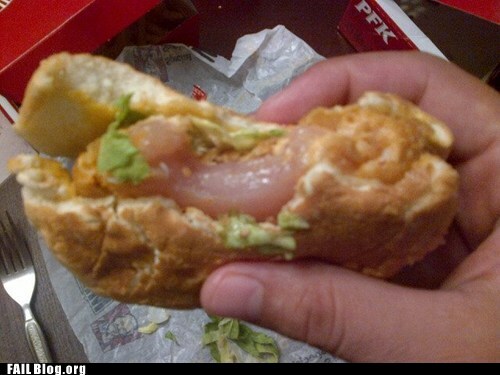 Plese tell me that isn't a breaded uncooked piece of chicken? I'd have to lie to do that. Finally, a sashimi sandwich has been found! Edited 1 time(s). Last edit at 10/13/2012 10:15PM by chicagocwright. The Pizza at Curry is the best in the Valley! I find that people who opine otherwise are frequently those who burp loudly at cocktail parties and park over white lines in parking lots. On a more serious note, have you (or anyone else) ever bothered to try a meal at the higher-end Mountain Room? It just seems a little too pricey and white napkin-y to be worth it, and if one really wanted that, the Ahwahnee is just a short trip away. We eat at the Mountain Room often. They have a very good Prime Rib there that is always on the menu. While it is pricey, the prices are less than a dinner at the Ahwahnee. We also like the menu at the Mountain Room better than the Ahwahnee dinner menu but that is a personal preference. If we go to the Ahwahnee it is for lunch because they have a good burger and sandwiches there plus you can't beat the ambiance. Both restaurants have seasonal entrees, soups and salads. Also, you don't have to dress up for dinner at the Mountain Room so it has a more relaxed atmosphere then you have at dinner at the Ahwahnee. If we go to the Ahwahnee it is for lunch because they have a good burger and sandwiches there plus you can't beat the ambiance. The Ahwahnee Dining Room is an excellent spot for a nice peaceful lunch within Yosemite Valley. I actually find the Mountain Room prices less inflated compared to any other eating establishments in Yosemite Valley outside of Degnan's Deli. The prices that the Mountain Room charge are very comparable to what the same type of restaurant would charge in the Bay Area or in the Southern California metro area. The food is just as good as the Ahwahnee — and as already noted — one doesn't have to dress up to eat in the Mountain Room. I also find the wait staff to be less "stuffy" compared to the Ahwahnee Dining Room. Also if you dine early during the months of May and June, you could enjoy a spectacular view of Yosemite Falls if you're seated near their large picture windows. My family usually eats at the Mountain Room at least once on every visit to Yosemite. It's my favorite eating establishment inside Yosemite Valley. Loft all the way and only way! And I take pride in my parking skills! Blech, you cannot be serious! They sure have a wry sense of humor! I've had too many mediocre experiences that I pretty much skip Lee Vining when it comes to food, with the exception of coffee at Latte Da/El Mono motel. In Lone Pine, I've been known to make short work of large pizzas from whatever the pizza place is there after a Whitney climb. In Independence, I've eaten at the Subway more times that I care to admit, though there's a cafe there that's supposed to be good. Schatt's bakery in Mammoth has the rudest and most inattentive helpers I've ever seen in the rear portion of the place. "Yelp" reviewers raved about their turkey sandwiches, but they were awful. And I waited 25 minutes for one when there was no one else in the place. Dry, miserable, over-hyped. The Schatts turkey sandwich in Bishop is even worse and the crowds are horrific. Whoa Nellie is overpriced and the food is average. I've gotten sick on their potato salad and gotten mentally ill at dishing out $9.50 for a piece of chocolate cake. Their Farmers Bros. coffee is the worst coffee on planet earth. Worse even than the Farmers Bros. coffee at the Indian Bingo parlor casino/gas station in Independence. Curry Village Pavilion buffet: absymal. Have also become physically ill eating their slop. The restaurant mentioned above in Independence in Jenny's. Have never stopped there, but have heard it's OK, no more. Edited 1 time(s). Last edit at 10/14/2012 08:20PM by Ulysses61. I was a cook for 10 years. Hays St. Cafe in Bridgeport is my fav. food on the east side for breakfast or lunch. Their ultimate burger was top notch! The Deli in Yos Valley has always done me right, plus they have fresh basil which they put on my sandwich. I agree that Degnans has great sandwiches. My favorite is the one with roast beef, cheddar cheese and a horseradish mayo. It used to be called the San Joaquin. Ever since we got sick after eating a Curry peperoni pizza a few years ago, we only get pizza at the Loft. I don't like the pizza at the Lodge cafeteria because it has some strange herbs on the crust and also a mixed cheese topping. Here's my favorites list from South to North, heading up 395 and back through 120. I avoid the valley so am not super familiar with the food there. Burger Barn, Bishop: Just tried this for the first time recently. Amazing burgers. Amigos, Bishop: sometimes it hits the spot, sometimes it doesn't. 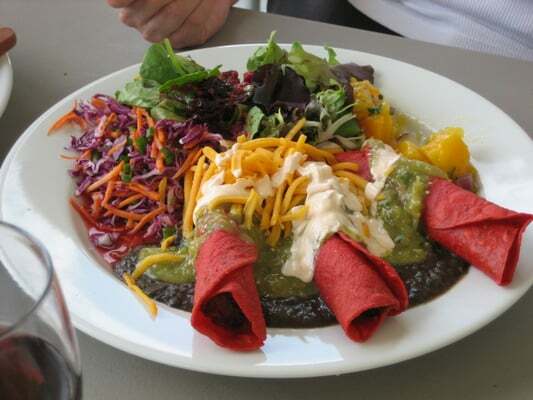 But if you want a big plate of americanized mexican food the enchiladas are lovely. Looney Bean, Bishop: My favorite spot for a coffee and pastry if I'm just passing through in the morning. Jack's, Bishop: I've only done breakfast here and it's always been good. Their side muffins and biscuits are huge. Good place if you have a bigger group. Petite Pantry, Bishop: Best chilequiles ever. Looney Bean, Mammoth: Same as Bishop. I rarely stop in Mammoth so don't have a lot of places there. Silver Lake Resort, June Lake Loop: Great eggs benedict. It's small though. Whoa Nellie: Mmmm fish tacos. Plus it's an awesome people watching place. Old Priest Station: Quiet but friendly crew. I once called to ask about closing time when we were in Oakdale. We were running late but they said they'd stay open for us and have burgers ready. And they did. Mmm. That 50's place in Knight's Ferry: Old school diner food but they are super fast and cheap. If I don't want to stop at Fast Food but still want a quick meal this is my normal stopping place. You get exactly what you'd expect here, from the liver and onions to the patty melt and fries. Edited 1 time(s). Last edit at 10/16/2012 11:28AM by calipidder. I actually rely on Yelp reviews on hotels and places to eat. It was solely because of people raving about the Schatt's turkey sandwiches in Bishop and Mammoth (yes, they are definitely still open) that I went to both places. A mistake. The food at Whoa Nellie's was marginally better when Matt Toomey still ran the place and cooked the food himself. Now he has his own place in Mammoth Village called Toomey's, which offers basically the same food as the Mobile gas station but with even higher prices. I'm no cheapskate, but refuse to pay $14 for two tacos at Whoa Nellie and $9.50 for a piece of chocolate cake. I admit I am no food connoisseur and am perfectly happy eating Dominoe's pizza in Mammoth after hiking. I also think the Deli sandwiches in both the Mammoth Vons or Bishop Vons are just as good as the food at Whoa Nellies. I admit I am no food connoisseur and am perfectly happy eating Dominoe's pizza in Mammoth after hiking.------I could not have said it better! That explains why you don't appreciate the highly esteemed Curry Pizza Deck! I actually rely on Yelp reviews on hotels and places to eat. I am no food connoisseur and am perfectly happy eating Dominoe's pizza in Mammoth after hiking. I also think the Deli sandwiches in both the Mammoth Vons or Bishop Vons are just as good as the food at Whoa Nellies. I have not had the pleasure of eating in my beloved Yosemite for a number of years, but I look forward to the next opportunity and I hope the few problem mentioned here are resolved. Having said that, I liked the Curry Co. employee meals, but that was in 1969 and part of 1970. The meals I ate in the Valley up to 2004 were tolerable to good. I would also like to share a zany story from my college years when I worked weekends in the park. I was so utterly impoverished that my budget only allowed a loaf of sourdough bread with provolone cheese and salami - for the weekend! It wasn't any fun, but the situation dictated procedure and I didn't starve. I could certainly do a lot better now, but I prided myself on how frugal I could be at the time. Actually, I do miss some of those days. Sorry to say this but we have see a decline in food, especially in the less expensive dining since DNC took over. The Mountain Room and The Ahwahnee has improved but have become too expensive. Degnan's has always been good and remains so. The cafeteria at Yosemite Lodge is horrible now and we stopped eating at the Curry Buffet a long time ago. One thing will be interesting to see is how the Curry dining will be after the change. Although there are many here who prefer Curry Deck Pizza, we like the Loft better. We got food poisoning some years ago after eating Curry pizza and this winter was the first time we went back. The crust was like some frozen pizza. I don't understand this since the pizza at the Loft has crust like you get at real pizza places. I do miss the Four Seasons that was at the Lodge that was a sit down place and served some of the same food , as it is now know as, the Mountain Room. I also remember when the loft used to serve all kinds of foods, even a good steak and some of the best burritos that I have ever had but that was in the late 80's, early 90's. As for your college fare, I like bread, cheese and salami but I hope that you had something different for breakfast. I haven't eaten any meal there other than breakfast, but I find the breakfast burritos at the Lodge cafeteria to be waaaaay above average. Lunch at Lodge cafeteria in early January of this year was a less than thrilling experience. I had the lunch special, a lasagna that was unappetizing in both taste and appearance, with tasteless soggy greens as a side dish and a stale bread stick to go with it. Possibly the worst lunch I have ever had. Only the fact that I had paid almost $13 made me take a few bites before I gave up. After several dismal dinners at the Lodge, we stopped going for dinner and only for breakfast. Then the last few times we had breakfast there, we ordered eggs over easy and only the whites were cooked enough and the yolk was slimy and running all over the plate. When we asked the cook to cook them a bit more, he refused. Several people after us were having the same issue and asked for the manager. These are the times when I wished that we were camping or at least had brought our camp stove. we ordered eggs over easy and only the whites were cooked enough and the yolk was slimy and running all over the plate. BTW, in an over easy egg the yolk is not cooked. It is supposed to be liquid. That's the way I like them and it can be hard to get cooked correctly. Sounds like you got a perfectly cooked over easy egg. Correct, what parklover described is a fried egg "over easy". Maybe what she wanted was "over well". "Over easy" or "over light", cooked on both sides; the yolk is a light runny and the egg white is fully cooked. "Over medium" — cooked on both sides; the yolk is of medium consistency and the egg white is thoroughly cooked. "Over well" — cooked on both sides until the yolk has solidified. "Over easy" fried eggs are also commonly referred to as dippy eggs or dip eggs by Marylanders, by Pennsylvania Dutch persons living in central Pennsylvania and those living around them, mainly due to the practice of dipping toast into the yolk while eating. And I thought my wife made up the term "dippy eggs". She grew up in Maryland and lived for many years in Pennsylvania. I guess that explains it. Edited 1 time(s). Last edit at 02/03/2014 05:25PM by Hitech. I never called them dippy eggs (being a California native), but I usually order my fried eggs "over easy" for the exact same reason: to dip my toast in the runny egg yolks. Over easy to me means that the yolks are cooked to the point where they are a thicker liquid than when they are raw. The yolks we got were barely cooked at all. Over easy to me means that the yolks are cooked to the point where they are a thicker liquid than when they are raw. But that's an incorrect interpretation of the term as understood by most other people, including most cooks. What you just described would be "over medium"
If "over easy", then only the very outer edge of the yolk should be solidly cooked, the rest of the yolk should be hot, but still very runny. Next time at the Yosemite Lodge Food Court, order your fried egg "over medium" and see if it turns out more to your liking. Yup. My wife was the general manager of an IHOP for awhile and most people who ordered over easy wanted over medium. They use to explain what over easy and over medium is when someone ordered it that way. Most changed to over medium. I want mine over easy. BTW, in my definition of over easy NONE of the yolk is cooked. The whites should be, but I'll take a little under cooked white as long as the yolk is not cooked. Same here, on all accounts. Before I met my wife I though the toast dip was a family thing. Apparently lots of other people enjoy their eggs the same as "we" do! Hugely popular on the east coast; I grew up with my father pulverizing the yoke all over the plate with the toast. All of the adults ate their eggs this way. I am originally from PA and I have never heard the term "dippy" eggs. Was she from the east side of PA? They use different terms from W. PA where I grew up. Edited 1 time(s). Last edit at 02/03/2014 06:17PM by parklover. I do miss the Four Seasons that was at the Lodge that was a sit down place and served some of the same food , as it is now know as, the Mountain Room. The Mountain Room restaurant always existed along side with the Four Seasons restaurant (which was adjacent to the Mountain Room restaurant). The Four Seasons Restaurant was converted over (either in 1994 or 1995) to the Garden Terrace (an all you can eat buffet restaurant). After the Great Flood of 1997 (which destroyed all of the Yosemite Lodge's cabins (with and without baths) and two of the three the Standard Room cottages, effectively shrinking the Yosemite Lodge from an over 500 room property to one with less than 250 rooms, the Park Service and DNC decided that extra dining capacity that the Garden Terrace provided was no longer necessary and the Garden Terrace buffet closed down. Now that space is just used as an event space for seminars, meetings and such. I have been going to Yosemite since 1987 so I remember when the Mountain Room was much smaller and they had a patio (now part of the restaurant) that you could eat on. Rereading my post, it looks like I was saying that the Mountain Room did not exist. I was referring to the fact that at one point I think that the Mountain Room had a slightly different name but I can't remember exactly what but it did have Mountain in it's name. I could be mistaken since that was decades ago. At first the Garden Terrace was OK but then went down hill. We used to stay at the cabins without baths at Yosemite Lodge. I miss the Four Seasons because it was a sit down place with waiters, had better food than the cafeteria but cost less than the Mountain Room. The Mountain Room did expand, but towards Yosemite Falls (they didn't cannibalized any part of the former Four Seasons restaurant space). Where the roof juts upward towards Yosemite Fall (with the giant wall of glass) is where the Mountain Room restaurant expanded. Wasn't it called the "Mountain Broiler Room" way back when? I worked at the Four Seasons in the mid seventies .If you had seniority you could hope to move up to the Mountain Broiler Room. Yes, that was the name I was trying to think of when I said that the Mountain Room had another name. I always liked sitting on the patio and looking at Yosemite Falls, before they added on. If you are familiar with how it looked before, you can see where they added on, like you said, after that one beam. Mammoth Schat's is owned by Erick's ex wife Shea. Sort of a feud between them, but in the divorce settlement, Erick had to relinquish his secret recipes to her. We do get volkeren bread at the Bishop Schat's, but the aforementioned Hing's makes better donuts and the Great Basin Bakery makes better bagels. We think Vons makes the best sourdough bread. 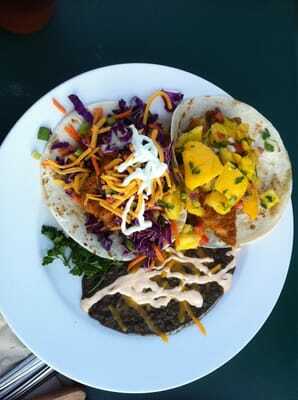 I've had the fish tacos at Whoa Nellie's. Had to take them home to reheat them as it was part of the Tioga Pass Run and I didn't have an appetite to eat them right afterwards. But they were good. Can't pay that much to try them again, though. Our only occassional dinner at a "restaurant" in Bishop is take out...pizza at Pizza Factory. That would be part of my last meal on my dying day if possible. 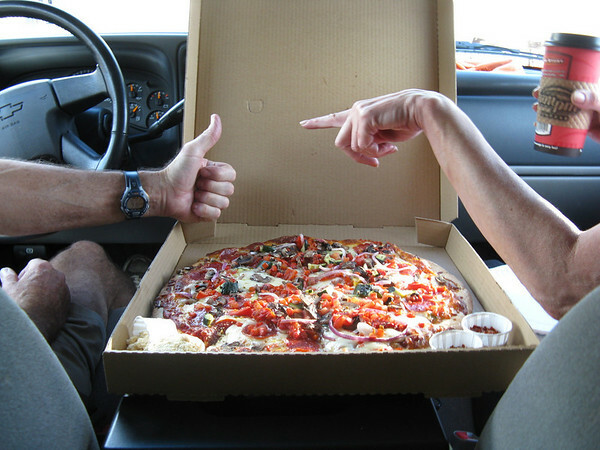 As for Yosemite fare, we do get a Curry pizza when we go in February becuase we stay in a tent cabin and don't cook. And sometimes a group of us have a few for lunch in June. Eat it in front of the store, where we purchase our beer. It is acceptable. I think it has improved from years back. edit...oh yeah, the waitresses at Tom's Place ARE rude. Ha...quite entertaining. We just tease them about it. Edited 2 time(s). Last edit at 02/03/2014 11:10AM by hikerchick395. Got a pizza from Perry's last Friday. Still good but I remember it being better in the 80s. Generally speaking, for a variety of reasons, food usually tasted better when we were younger, in this case 30 years younger. By the way the cook at Whoa Nellies went to a restaurant in Mammoth about a year ago..
Like Nicelys in Lee Vining. Heard that Whiskey Creek in Bishop closed down. And that Barbeque place in Bishop that's been there forever (Bill's?) Looks like that restaurant place on the left side of 395 (going north) in Lone Pine (think it had a Irish name to it?) closed also. How come there's not even one fast food place in Big Pine? Pizza...Several decades ago, I worked my way through grad school in a Portuguese-owned pizza parlor/bar/restaurant that was staffed by Swedes, Iranians and the remainder a mixture of zany souls. I learned to make pizzas from scratch and I have been regaling family and friends with homemade creations ever since. In the past several years, I even started making Dutch oven pizza during camping trips, so unless a burn ban was in effect - Lord forbid - I could probably make out OK. I know I would do better than sourdough bread, salami and provolone cheese! Wagga has since returned to the land of Oz, so the memory is that much more special. I am not happy to hear that the quality at the Lodge cafeteria has gone down as it is basically the only place I eat when I visit in winter. Will be there this coming weekend, I guess I will report back on the food. I haven't been to Yosemite since summer, but the quality of food at the Yosemite Lodge Food Court has remained basically the same for the last three or four years, IMHO. I haven't noticed any decline (which is good because the overall quality of their food wasn't the great to begin with). I've had many weeklong stays at the Yosemite Lodge during the winter, including last February and it takes some strategizing to not get sick and tired of the limited food offering that's available to Yosemite's overnight visitors in the winter months. The number one goal should be to avoid as many dinners at the Yosemite Lodge Food Court as possible. Their dinner entrées are very hit and miss (with more times being a miss). The safest choices at the Yosemite Lodge Food Court for lunch and dinner are usually their burger and hot sandwich options served at the Food Court's grill counter. But one can eat only so many burgers during the week. If you're staying overnight on a Friday or Saturday night, take advantage that the Curry Pizza Deck will be open on those nights (the Pizza deck is closed all other nights during winter — except for the Sundays before MLK day and Presidents Day and sometimes throughout Presidents Day holiday week). Also splurge and have at least one of your dinners at the Mountain Room restaurant at the Lodge. When I visit, I usually eat the Mountain Room the last night of my stay. And if it's a week long stay, I might eat there during my first night at the park too. For breakfast, the breakfast food options available at the Lodge's Food Court are still fine. On winter weekend mornings, you'll even have an option usually to order an made-to-order omelet (take advantage of this when available). Edited 2 time(s). Last edit at 02/04/2014 11:34PM by plawrence. The food at the Ahwahnee may be better than the other places, but it is not what one should expect for the prices. The quality there has gone downhill too. I agree although we had a nice dinner at the Ahwahnee this summer when we went for my birthday. The current chef uses too many sauces for my taste. If we eat at the Ahwahnee, we usually go for lunch. Even then we don't do that too often because of the price. Twain Harte's got some great places. I've not eaten in Yos Val for several years because I haven't been there since 2008. All trips since then have been to the high country via Reno. The overall impression I get from this discussion is that there really is no great place in Yosemite Valley for all day dining in both terms of price and quality. It sounds like the Valley is in dire need of a good quality family style or bar & grill style restaurant that one's wallet can afford. I think if a really good facility put out quality meals (breakfast, lunch, and dinner) at a truly reasonable price they would embarrass the local competition with year round success. Since the DNC controls all restaurants in the park, I doubt that could happen. About the only thing that might work is a restaurant built in El Portal. Edited 1 time(s). Last edit at 02/06/2014 11:11AM by hotrod4x5. The old Four Seasons was not a bar & grill but it had good food at a pretty reasonable price. I wish that they still had that. Like hotrod4x5 said, DNC controls what is there in the park. It would be nice if a bar and grill went in El Portal but I bet the Yosemite View Lodge and Cedar Lodge would block a restaurant that would take business away from their eating places. The old Four Seasons was not a bar & grill but it had good food at a pretty reasonable price. The Four Seasons was what was once referred to as a "coffee shop" like Carrows, Baker's Square and Marie Callender's. Edited 1 time(s). Last edit at 02/07/2014 12:37PM by plawrence. That was probably before I started going. I had a friend whose first trip to Yosemite was in the 1940's for her honeymoon. She had such great stories about Yosemite and how it was through out the decades. We normally camp (24ft. trailer) in the Valley so we bring our own food and the wife does most of the cooking. That way we get food we are used to and don't have to rely on the DNC to give us food. We do break away from the camp one night and go to the Curry Pizza porch, not so much to be looking for a good Pizza, but to enjoy the ambience of the Pizza Porch and the people watching. 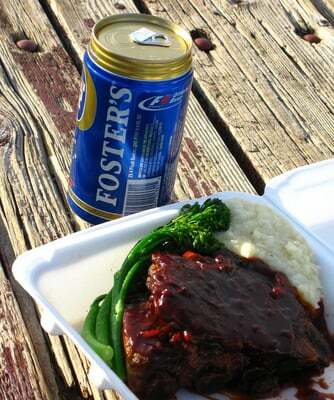 But there's nothing like a home cooked meal in the campsite. My favorite is a Southwestern Meatloaf cooked in a Dutch oven over charcoal. And then there's the bacon and eggs cooked outside on the picnic table in the morning. And those homemade sandwiches the wife makes in the morning before we take off on walks and bike riding. I don't think the DNC can replicate that! Also, the Four Seasons WAS more like a coffee shop. I never ate there...all of these years and amidst all of its transformations. And when I worked there in the "70's, the bar was squeezed in between the Four Seasons and the Mountain Broiler. The room between the lodge gift shop and extending to what is now the Mountain Room bar used to a large room, where people gathered after dark or in bad weather...talk about people watching! It was a lot of fun. I ate dinner at the Broiler once and enjoyed the huge windows, but back then, we had those big windows in the lodge gift shop, too, where I worked. We used to eat at the Four Season a lot and enjoyed the fact that some of the things that were on the menu at the Mountain Broiler (Room) were also served there and there were lesser priced entrees. They had some very good BBQ ribs there. The room between the Lodge Gift Shop and the bar is still there. They use it for meetings and weddings. Are you saying that it was much larger than it is now? I mentioned before that I miss what The Loft used to be like. They served all kinds of foods, including steaks and some of the best burritos I have tasted. The reason I mentioned bar & grill style was that these places often have rather good food. In late August five of us ate supper at a bar & grill in Bridgeport called Rhino's. I think all of us were pretty pleased with the quality of the salad and sandwich plates available. I personally think it was better than anything available in Lee Vining. I'm not a huge fan of Whoa Nellie Deli because the portions are actually too large and rather expensive. In late August five of us ate supper at a bar & grill in Bridgeport called Rhino's. I think all of us were pretty pleased with the quality of the salad and sandwich plates available. I personally think it was better than anything available in Lee Vining. Was the dinner before or after your group's backpacking trip in August? I ask because it's a scientific observation that the taste of food improves the hungrier one is. It's one reason why the Tuolumne Meadows Grill gets such rave reviews by people (who often have just finished a long day hike, or a multi-day backpacking trip). It's the same reason why the pizza from the Curry Pizza Deck gets rave reviews from a number of people too. I am sure that some people are going to get down on me for saying this, but I would have to hike a very long distance to like Curry Pizza the way it is now. IMO it has not been good for years and the Loft has better pizza. In December, we had Curry pizza and the crust was like those cardboard like, cheap frozen pizzas you can buy in stores. We ended up throwing most of it away. The Loft's pizza crust is nice and puffy. I have never understood why there is such a difference between the Loft, Curry and the Lodge cafeteria pizza. The Lodge cafeteria pizza has a cheese mixture and some sort of herbs sprinkled on the crust. When was the last time you had Curry pizza? If it has been more than three or four years, the pizza is not the same. We used to eat Curry pizza all the time. About 4 years ago it was a hit and miss thing where the crust was sometimes burned and there was hardly any cheese or topping on it and other times it was fine. That is when we started going to the Loft when it was opened because the pizza is consistent there. When we went to Curry in Dec, the crust was not the same, cardboard like and reminded me of a cheap frozen pizza crust. I just don't understand why it is like that now when they had such great pizza before. Didn't you skip eating at the Curry Pizza Deck during your last visit to Yosemite this past year? Are you trying to start a fight with my wife and I again? Are you saying that your wife doesn't hold the Curry Pizza Deck pizza in the same high esteem as you do? Edited 1 time(s). Last edit at 02/12/2014 12:13AM by plawrence. Yes, it was right after a 6-day hike in northern Yosemite/Toiyabe area but I've eaten many a meal in Lee Vining after long hikes and Lee Vining was not as good. In fact, I've been so disappointed regarding evening meals in Lee Vining I've almost confined it to the soup & salad option at Mike's. Your point may apply to the TM Grill. I've eaten there after hikes and a couple times without hiking. Definitely better after a hike. I agree that there can be a correlation between what you have done, how tired you are and how good the food tastes. As for Curry pizza, personally I have found that the goodness factor itself, no matter what you have done before you ate ,it has been fluctuating over time. It was consistently good in the 80's and 90's and then it started to become hit and miss. That is why we now go to the Loft when it is opened. The "meeting" room used to be double in size...it included what is now the Mountain Room Bar. There were a few programs and slide shows presented there, but it was mostly a gathering place to drink beer, play backgammon and watch climbers scale the wood beams. It was usually an upbeat place, but when a climbing accident occurred, you knew it by the mood. The lodge gift shop has gone through many transformations...it was split into a gift shop and a sport shop when I worked there, divided by a hallway that connected where the doors currently are. Then the shop shrunk to the gift shop only. Now it is about the same size as in the 70's but it isn't divided. There have been lots of changes over the years - some good and some bad. Getting a good meal at a good price has been a issue for many years now. Can't afford to eat at the Mountain Room and Ahwahnee all the time and would like something intermediate between the two and not just the grills, cafeteria and pizza. Well I am back to report that the lodge food is as disgusting as reported. We had 4 "light eaters" burgers and they must have been soy or something because they were gross. The next night I had one of their pizzas, which was decent, but way over priced and my fiance had the philly cheese steak which she said was gross. Our third night we ate burritos and DiGiorno pizzas purchased at the Curry Village store and had a much better, and cheaper dinner. Where did you go and what did you have for breakfast and lunch during your stay? For breakfast we ate stuff we brought, cereal, fruit, etc. We had one lunch at Degnan's deli, which was very good, I had their daily special, a taco salad, which was loaded with lots of meat and other goodies and Leslie had a #6 sandwich which was also excellent. (and priced the same as the pre-made, wrapped sandwiches at the lodge) The kids had lunchables from the refrigerated case which is what they chose. Our other lunches were sandwiches and snacks we brought. Edited 2 time(s). Last edit at 02/16/2014 08:43AM by hotrod4x5. The only thing the Pizza Factory in Lone Pine has going for it is lack of competition. Unless you like limp, soggy pizza like I had today. The only thing the Pizza Factory in Lone Pine has going for it is lack of competition. A bit pricey (but what dinner place in Lone Pine isn't?) but far better compared to Lone Pine's Pizza Factory is Merry Go Round (serving American AND Chinese food). It's right next door to Seasons. It makes perfect sense that a rude and unreasonable chicken would find its way to the menu. But there is one restaurant that stands out in a completely different way. We have eaten there at least five times in the last ten years, and every single time it has been worse than disappointing. It's the restaurant at Grant Grove Village in SEKI. Has there been any improvement since DNC took it over? Any better options heading out towards Fresno? Edited 1 time(s). Last edit at 05/17/2014 02:41PM by Sierra Miguel.